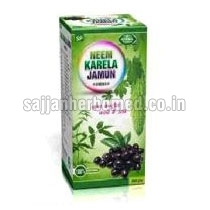 Neem Karela Jamun Powder helps to control diabetes (high blood sugar and urine sugar). Our companyâ��s name figures in the list of eminent Suppliers of Neem Karela Jamun Powder from Punjab, India. We source the Jamun Powder from trusted vendors only. Accurate composition, zero side effects and high effectiveness make our Jamun Powder the preferred choice among customers. Customers can purchase the quality enriched Powder at pocket friendly rates. Dosage : Half to one t.s.p twice a day or as directed by the physician.